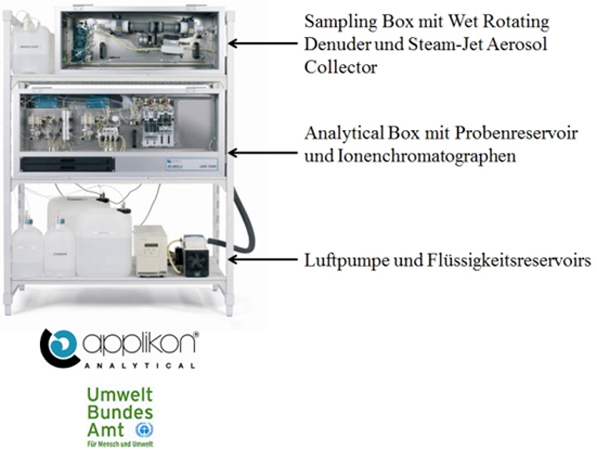 In collaboration with the Umweltbundesamt the MARGA system (Monitor for AeRosols and Gases in ambient Air) is used at the research station of the Leibniz-Institut für Troposphärenforschung (TROPOS) in Melpitz. The instrument was developed by Metrohm Applikon (Netherlands) and uses a combination of a wet-rotating denuder (WRD) and a steam-jet-aerosol-collector (SJAC) to capture the watersoluble ions in particles (Cl-, NO3-, SO42-, NH4+, Na+, K+, Mg2+, Ca2+) and the corresponding trace gases (HCl, SO2, NH3, HNO3, HNO2) in a time resolution of one hour. After passing a teflon coated PM10-inlet the sample air enters the WRD which captures the water soluble gases with an absorbance liquid (pure water). Connected to the WRD is the SJAC where the air is mixed with steam of purified water. The supersaturation in the SJAC causes particles to grow rapidly into droplets. These droplets containing the dissolved inorganic ions are transferred into a sample reservoir. The resulting liquid solutions of the denuder and of the SJAC are analysed online via ion chromatography with conductivity detection. Two different aerosol mass spectrometers are used to measure the aerosol particle chemical composition (Organics, nitrate, sulfate, ammonium and non-seasalt chloride). The High Resolution Time of Flight Aerosol Mass Spectrometer (HR-ToF-AMS, Aerodyne Inc, USA) is deployed during specific intense measurements periods while the Aerosol Chemical Speciation Monitoring (ACSM, Aerodyne Inc, USA) is used for long time monitoring and continuously measured since June 2012. While both instruments are based on a similar concept, there are some major differences therefore they will be described separately. By crossing the aerodynamic lenses, aerosols are sampled and focused into a narrow beam. Particles are transmitted into the high vacuum of the instrument and accelerated to a velocity inversely related to their aerodynamic diameter. Particle beam is them impacted on a vaporizer (a resistivity-heated surface at 600°C) and flashed vaporized. The resulting vapors are ionized by electron impact (EI, 70eV) and detected by a High Resolution Time of Flight mass spectrometer (HR-ToF). Before reaching the vaporizer, the aerosol beam is controlled by a spinning wheel (approx. 150Hz) equipped by two slits. This wheel allows two alternative detection modes: by blocking/unblocking the particle beam, the AMS measures the bulk chemical composition of the particle (MS-mode) and when particle beam is controlled by the slits of the wheel, the AMS provides the particle size resolution (PTOF-mode). Because soot, crustal material and sea salt cannot be detected and the transmission efficiency of the aerodynamic lenses; the AMS is commonly considered to provide non-refractory PM1 aerosol chemical composition. The instrument is typically working at a 5 min time resolution. Although, the ACSM is based on a similar approach than the HR-ToF-AMS, the main differences are the absence of size distribution information and a simple unit mass resolution quadrupole mass spectrometer. In absence of rotating wheel, the chemical composition of particles is obtained by alternatively measuring ambient air and particle-free air. In addition, internal naphthalene standard located inside the chamber is used for monitoring the performance of the instrument over long time period. The ACSM is measuring with a 30 min time resolution.